For some reason when I grocery shop each week, I either think that secretly in our sleep we eat cans upon cans of garbanzo beans, or I think that I may need to prepare a garbanzo bean salad for the entire Duggar clan every day for a month. Either way, I always end up with at least two cans in my cart. But we eat maybe a can every other week, and that’s a generous estimate. Which means there are currently 48 cans floating around my kitchen, which, in turn, evokes some creativity on my part since we don’t have a dedicated pantry, or all that much storage space in our kitchen at all. So hiding these mass quantities of chickpeas from DTH’s judgment face (“More chickpeas? What happened to all the other cans…?” Ahem, don’t check behind the washing machine), is tricky. This weekend, after purchasing two more cans with coupons, I decided it was high time to use those pearls of fiber and protein, and owing to a leftover can of organic pumpkin from a late fall Trader Joe’s haul last year, I set about to create pumpkin hummus. And I did. And it was delicious. Now I need to replace the two cans of garbanzos I used with several more, so I can make it again and again this fall. Seriously, folks, it’s the best (brief throwback to Homestar Runner, anybody? No? Just me? Okay, then). 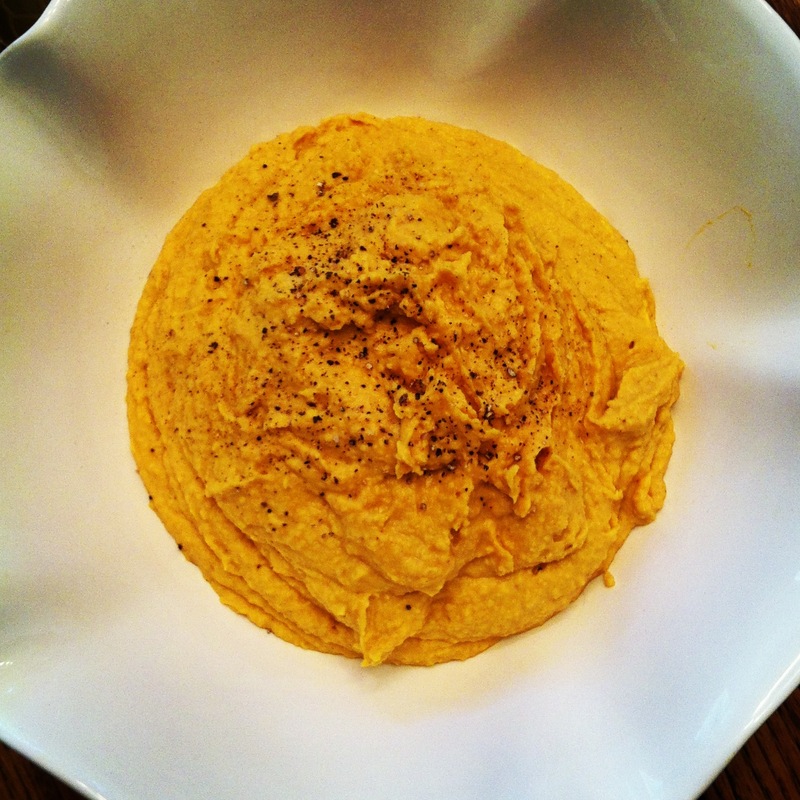 In a food processor, combine tahini, lemon juice and garlic cloves. Puree until garlic is minced and well combined. Add garbanzo beans and olive oil. Pulse until mostly smooth. Add pumpkin and all spices, puree until creamy. Taste and adjust spices as preferred, finish with sea salt and black pepper. What size can of pumpkin purée? Hi Ashley! I just used a standard size can… Which is 16 oz, I believe.